Photo courtesy of Cheri Scalf, WDFW. Hood Canal supports all eight of the salmon and trout species that use marine and freshwater systems in the Pacific Northwest. These iconic fish are a critical component of the food chain and have helped sustain human and animal populations for millennia. Hood Canal Summer Chum salmon, Chinook salmon, steelhead trout, and bull trout are listed as threatened under the federal Endangered Species Act. All Hood Canal salmon and trout species face many challenges to recovery, including habitat degradation, varying ocean productivity, and changing climate conditions. Past harvest and hatchery operations in Hood Canal have suppressed healthy salmon populations; today they are being managed to help maintain and recover at risk salmonids. Our goal is to remove these species from the Endangered Species List and sustain harvestable populations. This is central to our shared economy and the sustained health of all Hood Canal residents and visitors. And it is essential to honoring our treaty obligations to Hood Canal tribal nations. All salmon species have unique life histories and we are developing suitable strategies to address their needs. Learn more about the successful restoration of Discovery Bay, the estuary of Salmon Creek and Snow Creek. Learn more about what each of us can do to help recover our Hood Canal salmon. Available data shows strong populations during the mid to late 1970's, a precipitous decline during the ‘80's and early ‘90's and a rebound starting with the late ‘90’s that continues into the 2000's. Hood Canal is home to a unique species of salmon called summer-run chum salmon. They are the first spawners to return each year, starting in August. Summer chum have been documented in most of the major rivers that drain to Hood Canal. Summer chum are the only salmon species that does not spawn high up freshwater streams, but in the lower one or two miles of their home rivers, making river estuaries important nurseries for young fish. The abundance of spawning fish dropped significantly in the 1970s and 1980s, to the point where several subpopulations went extinct. Their numbers rebounded in the 1990s, and are approaching the recovery goals in both the Hood Canal and Straits of Juan de Fuca populations. This trend is very encouraging, although the question remains: how much is attributed to favorable ocean conditions and how much is the result of habitat and harvest management improvements? Sustained healthy summer chum populations during less favorable Pacific Decadal Oscillation cycles will determine true species recovery. How are the wild Summer Chum doing? 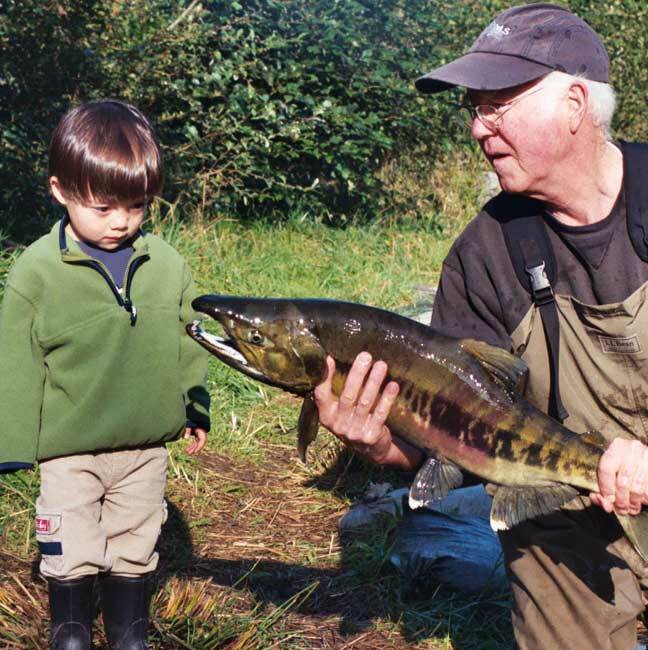 Where do Summer Chum spawn in Hood Canal? What challenges face Summer Chum recovery? What are we doing to improve Summer Chum populations? For more detailed data on Summer Chum abundance please visit WDFW’s population status site, or the Governor’s Salmon Recovery Office data site. The challenges facing recovery of Hood Canal salmon are similar across all species. The survival rate and population decline in the 1970s was caused by: general habitat degradation, excessive fish harvest; and natural cycles in ocean production. Climate change is anticipated to be a significant threat in the future. Oceanic climate changes influence local seasonal weather patterns, potentially resulting in unfavorable stream flows during the winter egg incubation season. And research has found that our activities in the Puget Sound region add a measurable impact on local climate changes. Net fisheries in Hood Canal, when combined with harvests in Puget Sound and the Strait of Juan de Fuca, contribute to a lower number of summer-run chum salmon returning to the ocean. Information has recently emerged that suggests the Hood Canal bridge is a barrier to out-migrating young salmon and steelhead, as well as an impediment to the circulation of oxygenated water throughout the canal. The HCCC has formed a steering committee to facilitate efforts to assess the scope and severity of the bridge’s impact and propose potential solutions. Recent hatchery reforms have identified ways to limit impacts to wild salmonids and their genes, while contributing to sustainable fisheries.